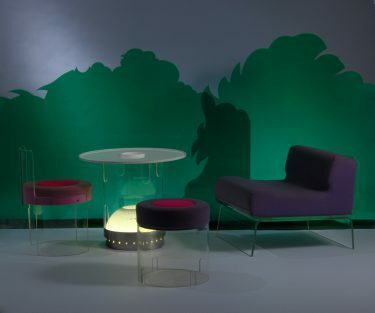 With the presentation of the furnishings of a south Tyrolean nightclub the focus is likewise directed at the year 1968. The Discoteca Il Grifoncino that opened that year in Hotel Greif in Bolzano represented the esprit of a new pleasure-seeking generation that sought relaxation in the late 1960s amongst other things in music and dance. However, the design also reveals another idea. Known for their luminaires resembling pills, the designers Cesare Maria Casati (b. 1936) and Emanuele Ponzio (b. 1923) had together with artist Gino Marotta (b. 1935) created a transparent club landscape that was originally surrounded by PVC curtains shaped like clouds and artificial bushes. Furnishing elements in green, pink, blue and violet alternately illuminated the acrylic-glass installations, which responded to the rhythm of light and music. The idea was to create a fantastic vision for the future. The disco movement saw its heyday in the 1970s, making the nightclub in Bolzano one of the first clubs to celebrate this new form of entertainment.